karmany abhipravrttopi naiva kincit karoti sah. kincit na karoti eva = certainly does not do anything. Once one has given up attachment to actions as a means of obtaining rewards as well as giving up the desire for the rewards of actions one becomes tranquil and content without any need for acquisition or accumulation. Such persons although sometimes appearing to be engaged in actions naturally or prescribed, factually do nothing as all their activities are actually inaction. This is Lord Krishna's meaning here. Whoever has completely given up all desires and attachments to rewards for actions, who is also nitya-trypto or totally content immersed in the atma or soul, whoever is self satisfied never depending on anything from prakriti or material existence. Such a person although seen to be intently performing various prescribed actions, in reality performs inaction meaning no action that has any binding effect. Because although externally such a person might appear as if performing activities but internally that person is actually cultivating spiritual knowledge and meditating on the atma and thus exempt from any binding effect. 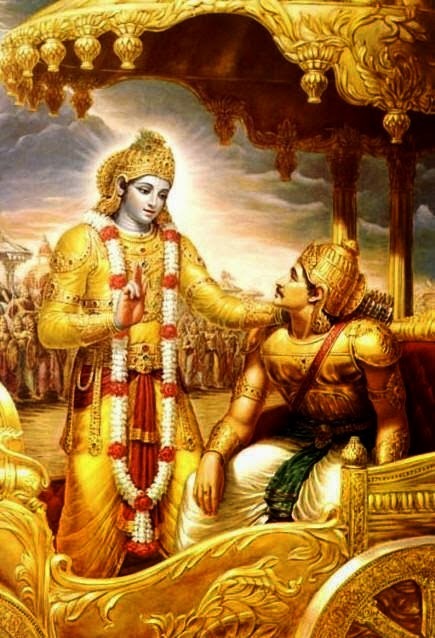 Lord Krishna gives the spiritual intelligence aspect of actions is next.